In Washington, D.C., Sunday night, the stars of politics and the silver screen joined together to honor the lifetime achievement of five of the nation's premiere performance artists. The occasion, reports CBS News correspondent Whit Johnson, was the 34th annual Kennedy Center honors, in which colleagues and admirers fete the honorees. Among the five honorees was two-time Oscar-winning actress Meryl Streep. Actor Robert DeNiro said to Streep, "You don't get all these awards just for hanging around -- you earn all those real awards simply by being the best, and Meryl, you are the very best." Songwriter and performer Neil Diamond was also recognized. Actor John Lithgow said of the singer, using the name of title of a song he did, "When it comes to Neil Diamond, I'm a believer -- we're all believers." Caroline Kennedy, who hosts the show as part of a living memorial to her father, the late President John F. Kennedy, acknowledged her personal connection with one honoree. In a nod to Diamond, she said, also using the title, and lyrics from a song of his, that Diamond was "a Brooklyn lad with a gift of melody who grew into a solitary man, `reaching out, touching me."' That was enough to draw big laughs as the crowd of celebrities and politicians recalled that Diamond's "Sweet Caroline" was named for her. Cellist Yo-Yo Ma was also honored, and celebrated by TV comedian Stephen Colbert. "Tonight, we celebrate the greatest living cellist. Tonight, we 'cellobrate,' if you will," Colbert said. "...Yo-Yo doesn't just play the cello, he shreds it -- he rocks it." Jazz great Sonny Rollins was also recognized. During the ceremony, actor Bill Cosby said, "All over the world, Sonny Rollins -- and Snnny, tonight, welcome home." Another honorees was theater legend Barbara Cook, who made her Broadway debut in 1951. Sarah Jessica Parker said of the star, "Barbara Cook at the Cafe Carlisle belongs on that very short list of beloved New York treasures." The annual awards ceremony brings together the greats in music, stage and screen, recognizing their distinguished careers, and commitment to their craft. Earlier in the day, President Obama praised them for sharing their gift: "By expressing themselves, they help us learn something about ourselves. They make us laugh. They move us to tears. They bring us together, and they push the boundaries of what we think is possible. Celebrating, says Johnson, talents that are distinct, but carry the power to unify. 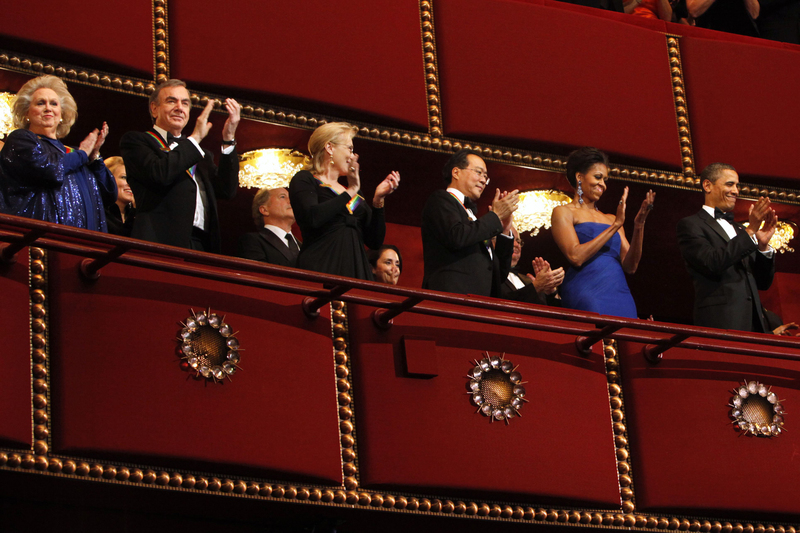 You can catch the entire Kennedy Center Honors telecast December 27 at 9 p.m. ET/PT on CBS.